For more than 20 years now, the Viper has had the reputation for being one of the most unmanageable, most ballsy cars available at any price. Those were the first words out of SRT CEO Ralph Gilles’ mouth as we looked down the hill at the Big Willow Raceway outside LA. We journalists had spent the morning up on the “the balcony”, where I proceeded to put down the slowest autocross times of the day. “Is everyone else here really a motorsports writer?” I wondered to myself. Even as my times improved, the times of the other drivers seemed to improve faster. No matter – I feel more at home on the track anyway, After all, I had visited Big Willow just two weeks prior with AMG. But this trip wasn’t about quarter-million dollar cars and all-wheel-drive systems that can save you in a pinch. Rather, what brought me back to Willow Springs Raceway was something that requires a more careful hand and endlessly more respect, lest you get bitten. This trip was all about conquering my Ophidiophobia, the fear of snakes, and this trip would focus on the 2014 SRT Viper. Ralph Gilles is full of wonderful little quips about life, driving, and his cars. He’s not afraid to drop the occasional curse word, or to cut a mischievous glace over at his PR team when he says something a little too honest, a little off-color. And for that, the things he says have a sense of truth and passion to them that don’t feel rehearsed. So, when he looked almost pleadingly, describing the Viper as both “one of the most misunderstood” cars on the road, and one that “isn’t everyone’s cup of tea,” he had me hooked. For more than 20 years now, the Viper has had the reputation for being one of the most unmanageable, most ballsy cars available at any price. Past models have lacked traction control, stability control, and virtually every other modern technology designed to keep the car in a straight line. Instead, it was a car that created one of the most intimate connections to man and machine, but in a way that was flat-out dangerous to inexperienced drivers. The SRT Viper, which debuted last year, came back to the market with more power, more technology, and more aides than ever before. Some purists complained that the car had been neutered, while others celebrated the fact that it was finally manageable for the masses. And while there’s an argument that the Viper may have only one real competitor – the Corvette – no one disputed that it remained the only exotic car built by an American automaker. 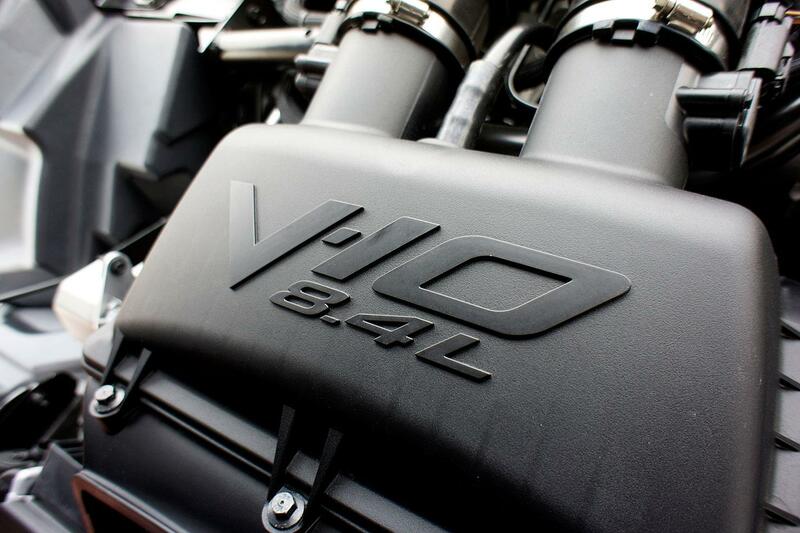 Today, it’s offered in three trims, all with the same 8.4-liter V10 producing 640 horsepower. There’s the base SRT, the lightest, rawest and most affordable of them all. For folks looking to spend longer trips in the car, the GTS offers a more comfortable ride with a quieter interior. And, new for 2014, there’s the TA (Time Attack), which combines track-ready brakes, tires, suspension and aero-work with a slightly better ride for daily use. It’s the race-by-day, valet-by-night model in the group. It’s hard to feel cute as you pick yourself up off the tarmac. Getting into and out of the Viper was a challenge, especially for my 6’2” frame. I’m all gangly arms and legs, and the side-mounted exhaust and ultra-low center of gravity meant I had to essentially fall into the car, and back out onto the asphalt between runs. At least I had a helmet to hide my blushing cheeks. 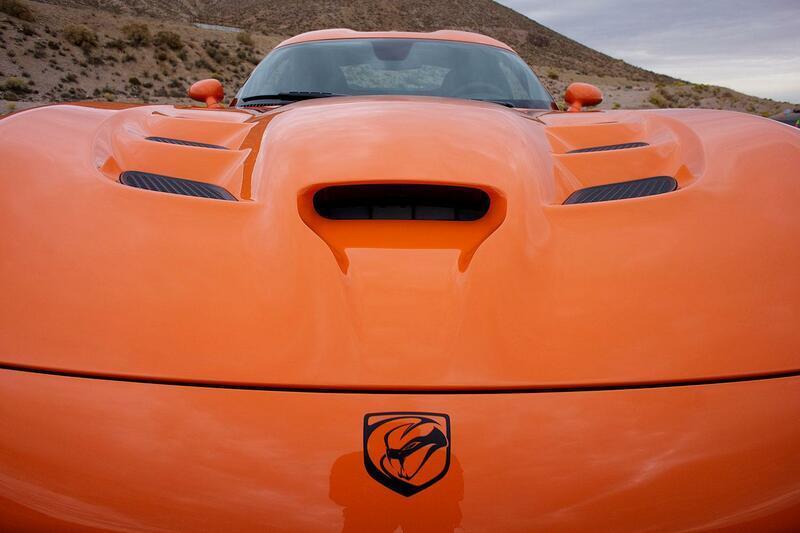 When I first saw the Viper, I thought I was enormous, with its monstrous hood and giant tires, shockingly, but it’s not. Rather, it’s actually two inches shorter than a Porsche 911, and just two inches longer than the very petite Scion FR-S and Subaru BRZ twins. Maybe the folks at SRT are illusionists? 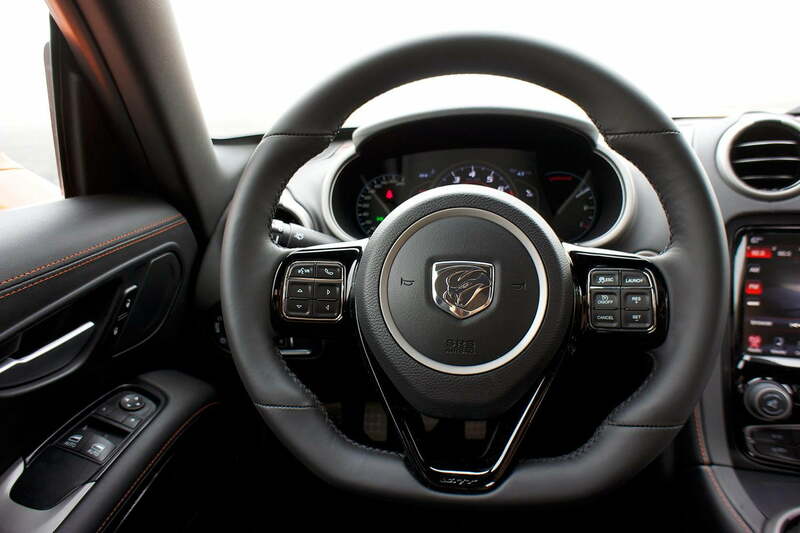 Once inside, the Viper felt much smaller, much tighter than its exterior dimensions suggested. The transmission tunnel rises up between the seats, and the console with Uconnect is angled toward the driver. I was in a cockpit, if there ever was one. 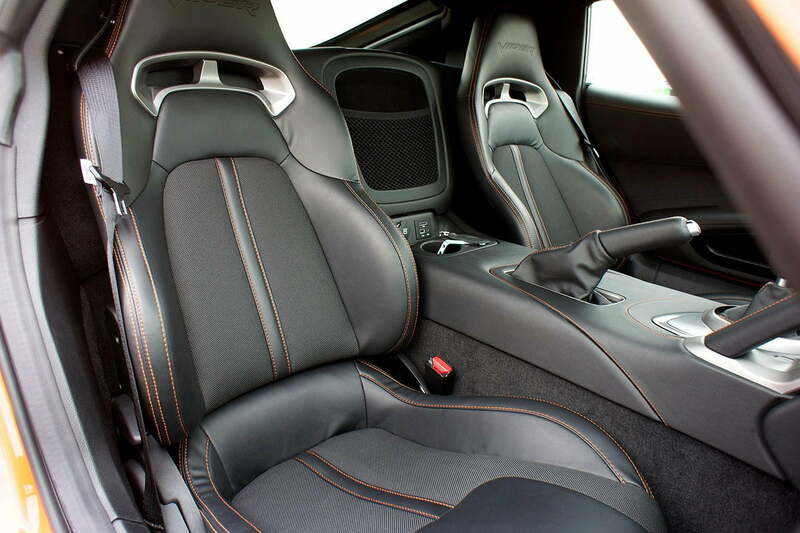 The seats hug in a way that a real sports car’s seats should, bolstered for the corners, but supportive enough for long days behind the wheel. And the six-speed was easy to manipulate, with excellent power delivery across all gears. That didn’t really come as a surprise with 640 ponies riding shotgun, though. My only complaint here is that the clutch is a little long for my taste, which required me to sit closer to the wheel than I would’ve normally preferred. In truth, the Viper’s seating position reminded me of driving the Mercedes-Benz SLS AMG, another track terror that I truly love. On days spent at the track, I’m pretty convinced that the Viper might even be the better car, too, and that’s even before considering the fact that it’s half the price of the Benz. However, road trips will be better spent in the Mercedes. There are more creature comforts in the AMG powerhouse, and, as much as I love the nasty, wonderful exhaust note in the Viper, it’s a bit much when you’re trying to relax for longer stretches of road. It didn’t take long for me to remember the lines that I needed to drive to move quickly through Big Willow. Even with an extra chicane intended to slow us down, I felt at home in the Viper, and it seemed like it wanted more from me. My laps got faster and faster, and, as I approached my own driving threshold, I could tell that the car was only operating at 75 percent. Even as I tapped the engine’s immense power and the tires’ Velcrocity (you read that word here first), I wasn’t able to push the car to the old levels of insanity we feared from past Vipers. That’s the beauty of this machine. It is absolutely faster than it ever has been, and it’s still one of the most connected driving experiences available on the market today. However, where some claim that it’s been dumbed down, I’d argue that it’s still every bit the expert’s car that it once was, with an added element of charm. It’s by no means a gentleman, but it might just be a bad boy with a nice streak. According to Ralph Gilles, the Viper is SRT’s playground for testing new performance technologies. 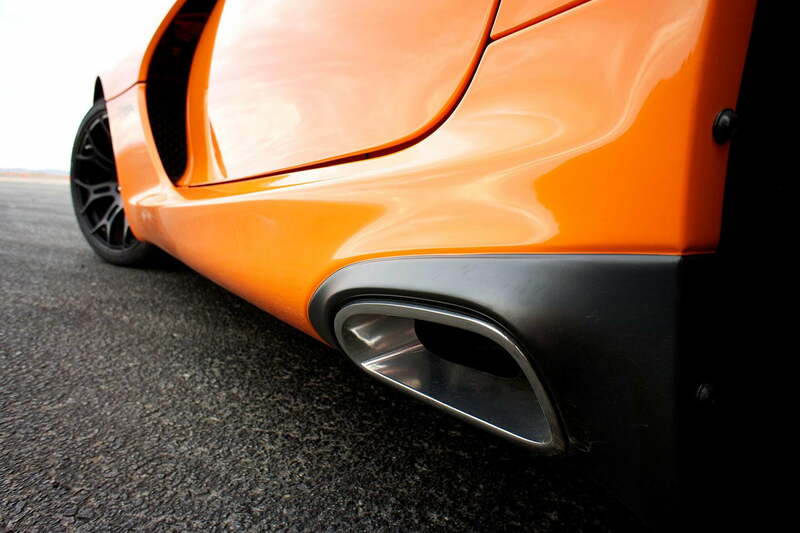 It’s a caricature of a sports car, with every feature inflated beyond normalcy. And that’s what makes it both misunderstood and completely unique in the market. It’s also the only American car in the business to claim real exotic appeal, in performance, style and price. While it may be a little less terrifying than it once was, the 2014 Viper still demands the same respect its garnered since 1992. Exotic car cachet, patriotic cachet, expert driver cachet.